A healthy adult makes about 2 million blood cells every second, and 99 percent of them are oxygen-carrying red blood cells. The other one percent are platelets and the various white blood cells of the immune system. 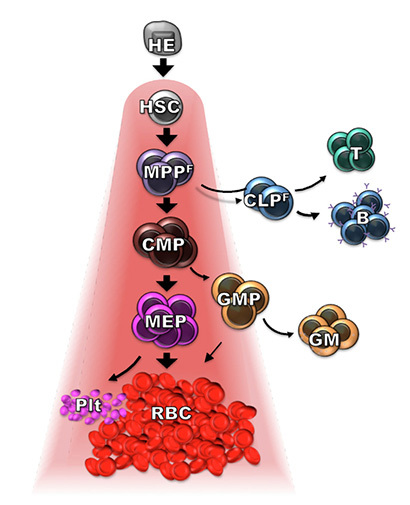 How all the different kinds of mature blood cells are derived from the same "hematopoietic" stem cells in the bone marrow has been the subject of intense research, but most studies have focused on the one percent, the immune cells. "It's a bit odd, but because red blood cells are enucleated and therefore hard to track by genetic markers, their production has been more or less ignored by the vast number of studies in the past couple of decades," said Camilla Forsberg, professor of biomolecular engineering in the Baskin School of Engineering at UC Santa Cruz. In a new study, published March 21 in Stem Cell Reports, Forsberg's lab overcame technical obstacles to provide a thorough accounting of blood cell production from hematopoietic stem cells. Their findings are important for understanding disorders such as anemia, diseases of the immune system, and blood cancers such as leukemias and lymphomas. "We're trying to understand the balance of production of blood cells and immune cells, which goes wrong in many kinds of disorders," Forsberg said. A key finding of the new study is that all progenitor cells with myeloid potential produce far more red blood cells than any other cell type. This was surprising because many previous studies in which progenitor cells were grown in cell cultures ("in vitro") found they had limited capacity to produce red blood cells and platelets. Forsberg said those results now appear to be an artifact of the culture conditions. In addition to Forsberg and Boyer, the coauthors of the paper include Smrithi Rajendiran, Anna Beaudin, Stephanie Smith-Berdan, Praveen Muthuswamy, Jessica Perez-Cunningham, Eric Martin, Christa Cheung, Herman Tsang, and Mark Landon, all at the UC Santa Cruz Institute for the Biology of Stem Cells. This work was supported by the National Institutes of Health and the California Institute for Regenerative Medicine.